Roger and JP are in a short-term foster home. Their foster mother Maggie is nice, but can't commit to keeping them forever. Each boy wishes for a family. Can their wish come true? Find out (and pretend it's still summer) as we take an adoption-focused look at this 1994 Disney film. Roger and J.P. are two young boys living in the short-term foster home of Maggie Nelson. We don’t know much of their situation. Roger’s birth mother passed away, and his father maintains some contact with him. J.P.’s father has passed away, but we aren’t told why J.P. is in foster care. Roger’s father shows up at Maggie’s foster home and tells Roger that, although he planned to take Roger back home, he won’t be able to. Roger asks when they will be a family again, and his father off-handedly says, “When the Angels win the pennant,” meaning “probably never.” Roger doesn’t understand his father’s intended meaning, and instead prays for divine intervention to help the last-place Angels. Heavenly Angels do start helping the California Angels, and against all odds, the Angels do win the pennant. Along the way, Roger and J.P. make friends with the Angels’ curmudgeonly manager, George Knox. Days before the Angels clinch the pennant, Roger learns that his father has relinquished parental rights and will not reunify with him. George is saddened at Roger’s grief and tries to comfort him. The film ends as George reveals that he has contacted Social Services and intends to take adoptive placement of Roger and J.P.
Roger and J.P. are in a short-term foster home. Both are hoping for family. J.P. wants a father. Roger wants to be reunited with his own father. Roger and J.P. have developed a friendship while living in the same foster home, and J.P. shares his concerns about foster care with Roger – will we be here a long time? If we stay a long time, will we have to change our names? They both remain hopeful that “something good” will happen. Eventually, Roger’s father voluntarily terminates his parental rights. Roger and J.P. end the movie overjoyed at the prospect of being adopted together. è Maggie seems to be a good foster parent. She hugs Roger when he cries, provides for the boys, knows her function as a short-term care provider, and is able to laugh off rude comments from one of the foster boys. è J.P. cries when he learns that one foster boy has moved from Maggie’s home. This is a good picture of the emotions that kids in this situation feel and of the bonds between foster family members that are created by stability. è George later has a very good line as he is working up to announcing his desire to adopt Roger and J.P., “You know, nothing’s probably ever as good as your real parents, but there’s some people who can care for you and love you and take care of you.” The first part of his sentiment is a bit off; adoptive parents actually are real parents. The second part of the sentiment is spot on. è This movie does show birth fathers. Typically, movies focus on the adoptive family or the birth mother. Birth fathers are often either omitted or portrayed as very violent. While Roger’s birth father does fail to pursue reunification, he at least shows up at Roger’s foster home and talks to him about it. è George’s baseball team functions as his family, and they warmly accept Roger and JP. è In one scene, a baseball fan tries to quiet Roger by brusquely telling him, “Tell your parents about it.” Roger does not seem hurt by this, but a more sensitive child might be hurt. è Maggie takes Roger home from the court case where Roger’s father has signed relinquishment of Roger to the court system. Maggie tries to comfort Roger by saying, “You know, by releasing you legally, it does make it possible for somebody to take you permanently. He did that because he wants the best for you.” She means well, but she really isn’t comfortable with Roger’s grief. His response confirms that she hasn’t helped: “Yeah, giving someone away is a great way to show them you care.” This scene could be a good point of entry for discussion on that topic. è It will be important to help a child understand that George came to love Roger and J.P. as he got to know them, not because of the angels that seemed to follow Roger around. Be sure to point out times when George is kind to Roger off the ball field. è Roger’s father shows up at Maggie’s home, and the visit is awkward and uncomfortable, as the father speaks only a few words. This particular visit is unrealistic in several ways: birth families of children in foster homes do not typically visit the child at the foster home, and visits are rarely unannounced. More unfortunately, many children do not get face-to-face explanations from their birth parents. Roger’s father visited to let him know that reunification was unlikely; this doesn’t usually happen. Roger is not given real reasons as to why his father can’t reunify with him, and the absence of satisfying answers is a realistic part of the foster care experience for many children. è Maggie has three boys of a wide range of ages (Roger, J.P. and Miguel) sharing a bedroom, and the children use sleeping bags rather than bed sheets. In California, there is actually a limit of two children to a room (and no more than a five-year age gap between those children). While families can get exceptions to these rules, foster care conditions don’t usually look like Maggie’s home. If Maggie were a real foster parent, she’d also be required to have sheets on those beds. è Maggie lets Roger and J.P. ride their bikes to the ballgame, but doesn’t actually know where they have been. In real life, she would need to be paying closer attention. è Roger is called in to court unexpectedly, with less than a few hours’ notice. He waits there all day. The family also has their schedule interrupted by social workers. Flexible schedules are important for foster parents, but the schedule isn’t always as chaotic as the movie would suggest. è George is easily able to find Roger’s foster home address and shows up unexpectedly. Foster home addresses are generally kept confidential, and certainly the address of placement of a specific child is not readily available. I imagine that, maybe off camera, Roger wrote down his address so that photographs he took with George could be delivered, and that's how George got the address;- foster kids do know their addresses and can give them out (a concern, especially in situations where a court has ordered no unmonitored contact with birth family members); but the movie doesn't show that at all, and so it really does look like, unbeknownst to even Maggie, George gets her address. Not super realistic. è It seems that George is able to take adoptive placement of Roger and J.P. just by calling social services. The process of adoptive placement is usually quite thorough. Sometimes, the process of adoptive placement can be “sped up” for a “non-related extended family member,” but George would have had to meet with a social worker before taking the kids. Maybe it happened off-camera. è Maggie says, “Most kids taken away from their parents by the court system have a good handle on reality.” She means to say that because Roger has experienced this particular circumstance, he isn’t likely to believe in fancifully good things. This isn’t quite right; a young foster child removed from his birth parent once explained to me that his birth father couldn’t be around because he is a super hero and is fighting bad guys. Don’t assume that a kid has understood and processed their circumstances. Talk with them. è This movie seems most likely to appeal to foster families with boys between the ages of five and eleven. The movie’s focus on Roger’s desire for a family, and particularly for his birth father, provides an easy way to start talking with a foster child about his feelings, wishes, and expectations. o Roger seemed happy when he learned that George wanted to adopt him. Why was he happy that the person who wanted to adopt him was George? o Why did George like Roger? o What adults do you feel close to? o Roger’s father spoke with Roger about not being able to live together as a family. Did your birth family ever talk to you? What did they say? Or, what do you wish they would have said? Is there anything you wish you could say to them? o Once Roger is adopted by George, do you think he’ll ever still wonder about his birth father? Will George let him talk about his birth father? o Roger was understandably sad after his court hearing, and Maggie rushed to comfort him, by telling him that his father relinquished him with good intentions. What could Maggie have done differently? o In the last twenty minutes of the movie, George has some good heart-to-heart talks with Roger. Which lines stand out most to you, and why? è Tony Danza’s pitcher, Mel Clark, is left in the last game of the regular season for a full nine innings, with a pitch count of over 160. That doesn’t happen anymore. è Chicago played in the American League West. They’re in the AL Central now. 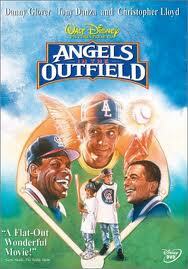 è The California Angels have changed their name twice since this movie. Want to read some more adoption-focused reviews of Disney movies about swinging? Not with bats, but from vines. Check out my reviews of Tarzan and Tarzan II. Looking for even more movie reviews? Diana at From Serenity to Survival is posting lists of recommended movies for families. Such an interesting post. I saw this movie ages ago and now I want to watch it again to look for all the scenes you mention.